This year, Nassau’s Lynden Pindling International Airport (LPIA) is marking the tenth anniversary of the Nassau Airport Development Company (NAD) with a number of events that highlight the strong links between the airport, its employees and the broader community. The last decade has seen the airport successfully transform into a catalyst for tourism and an important economic generator for the region, as well as a source of pride for Bahamians. LPIA, which is owned by the Government of The Bahamas, operated by NAD and managed by Vantage Airport Group, held a VIP reception for 150 guests in the airport’s outdoor gardens on April 1, 2017. Bahamian Prime Minister, Perry Christie, Governor General Dame Marguerite Pindling and Minister of Transport and Aviation Glenys Hanna Martin attended and were treated to a traditional Bahamian rake n’ scrape performance by local primary school students as well as local delicacies and an impressive four-tiered cake. As an anniversary gift for NAD, Vantage Airport Group commissioned a custom art piece from Bahamian artist Dede Brown. The piece, which will be displayed prominently alongside other Bahamian artworks in LPIA, features several hundred fish painted in tropical colours representing the variety and splendour of Bahamian sea life. An employee appreciation event was also organized for the airport’s 230 staff members and recognized the 65 employees who had been at the airport since NAD began its revitalization efforts ten years ago. “These employees’ hard work and dedication have been absolutely critical to our success,” enthuses Vernice Walkine, CEO of NAD. The anniversary also prompted the organization to undertake a creative community investment project. Using recycled wooden pallets and large cable spools, a group of airport maintenance specialists spent hundreds of volunteer hours building sets of outdoor benches and tables, which were then donated to local schools for outdoor reading and relaxation. 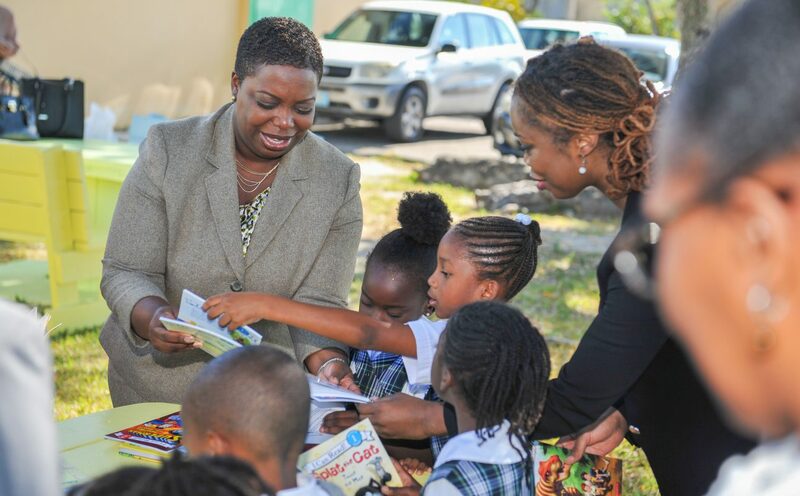 A company-wide book drive also collected hundreds of books for the school children to enjoy. In 2016 alone, 72 NAD employees attended specialized training courses and 50 received certification from outside organizations like Airports Council International (ACI), the Transportation Security Administration (TSA) and Six Sigma. More than 25 employees were also promoted within the organization. So while NAD celebrates its past success, it is also investing for the future and positioning itself for another decade of growth and improvement at LPIA.